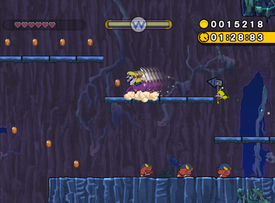 Lowdown Depths is a secret level in Wiggly Wilds in the game Wario Land: Shake It! It can be explored by finding a secret map in Sneak Peak. It takes place in a cave filled with many forks in the roads. Blue rocks form most of the cave with moss and other plantlife growing from it. The caged Merfle is found right at the start of the level, so the majority of the level is an escape sequence. Wario has 3 1/2 minutes to get out of the cave. The 'Golden Enemy' here is a Floating Bandinero. This page was last edited on December 11, 2018, at 18:28.